This past Sunday, there was a tornado that went through an area about 40 minutes from here. 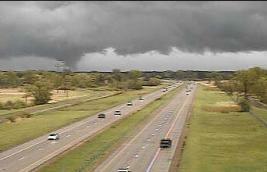 This same tornado made its way northeast and touched down less than 10 minutes from here. Funnel cloud about ten minutes from home. None of the warning sirens went off locally until the tornado touched down and had passed further north. Had it not been for my sister who has a weather radio, we would not have been aware of the tornado – it was a clear, sunny day at that point. It made me realize the importance of having a weather radio. This article from Minneapolis Public Radio talks about the siren failure and how important it is to have a weather radio – just like it is to have smoke detectors. Both are of equal importance. This will be something on my list to purchase in June. Despite seeing a tornado from one of the upstairs windows, the speed at which we were able to get downstairs and outside (we have an old cellar door that we have to go through to get to the basement – kind of like in the Wizard of Oz), was rather embarrassing. Most likely, we would be trapped, injured, or dead if the tornado continued on its path and we were inside the house. after the tornado passed through. Nearly 3/4 of all tornadoes in Minnesota occur during the months of May (15%), June (37%), and July (25%). This article has some interesting information about tornadoes in Minnesota, including some memorable ones (like the 2008 one that also was very close to here and damaged many homes). In the process of putting together the “Go-Bags,” the girls and I cleaned the medicine cabinet and grouped items together (e.g., first aid items, soap, shampoo). I gathered all the expired prescription medications together and will find a place to recycle them this week. Also threw away all over-the-counter medicine that was no longer good. Medicine cabinet after getting rid of expired medications. to create a good first aid kit and have needed items on hand. Having these items organized will make the next things we work on much easier (e.g., first aid kits). It also is easier to see now what we have on hand and what is needed for minor and serious injuries or emergencies. Great post! My hubby has always been big on having at least one bag of this sort, but until recently I never realized how right he is. Definitely important to have these resources! You did an excellent job preparing this week! Wonderful! Thanks for linking up and sharing. Great post – I need to borrow your list to make "go bags" for my family, even though we don't live in a particularly disaster-prone part of the U.S. We had a close call with severe flooding about 5 years ago, and a couple tornadoes have been too close for comfort. This would be a great lesson in preparedness for our kids.